Infoline: 01253 622 242 ticketline: 0870 380 1111. Blackpool Winter Gardens This Historic building dating from 1878 comprises 12 self-contained venues, each with a distinctive character and style. It is actually a complex of theatres and facilities for exhibitions, conferences, dancing, trade shows, banquets, weddings, and other occasions, all contained within an art deco exterior. There are two main entrances connected by a large arcade and some of the venues have their own entrances. Much of the construction dates from the 1930's. The winter Gardens is perhaps best known as a traditional home for political conferences: all three main British political parties have held their annual conferences here, as have the big trade unions. It is said that every British Prime Minister going back to the Second World War has given a speech here. Ever since its beginning in 1920 the Blackpool Dance Festival has also been held in the Winter Gardens, and since 1994 it has been the venue for the World Matchplay darts tournament. The chief component areas of the Winter Garden site are - the Empress Ballroom, the Opera House, the Olympia Hall, the Arena, the Spanish Hall, and the Horseshoe and Pavilion. The Empress Ballroom constructed in 1896 is a stunning architectural achievement, with its glittering chandeliers, intricately decorated balconies, magnificent vaulted ceiling, parquet flooring and vast dimensions, it has hosted music concerts, political conferences, dance festivals and a variety of other events. The Empress is described as 'the jewel in the crown' of the Winter Gardens. The Arena is a spacious venue having a neo-classical appearance made more dramatic by the inventive use of interior lighting. It it is used on its own or with the adjacent Empress Ballroom for banquets, meetings and presentations. The Spanish Hall is a spectacular art deco centre themed as an Andalucian village and provides a lavish setting for occasions ranging from wedding receptions to grand banquets. The ornate plastering was created by Andrew Mezzei, a well known film set designer and the hall retains many fittings from its original construction in the 1930's. The Horseshoe and Pavilion comprises a Promenade and Victorian theatre. The Horseshoe is a semi-circular construction containing an exhibition area, and at its centre is the Pavilion which has a seating capacity of 600 guests for shows, conferences and meetings. The Olympia opened in June 1930 is home to important trade shows and exhibitions. It is a spacious purpose-built venue and is the Winter Garden's main exhibition hall. Blackpool Fireworks - World Fireworks Championships Sundays or Fridays in September. The Grundy Art Gallery: In addition to its permanent collection of Victorian and Modern Painting, this purpose-built art venue which opened in 1911 hosts a wide programme of temporary exhibitions displaying historical, modern and contemporary art from emerging and established artists, and throughout the year there are exhibitions of works from the Gallery's collection. The Grundy also has a shop which specialises in artist made jewellery. The Gallery is open from Monday to Saturday between the hours of 10.00 am and 5.00 pm, and is closed on Sundays and Bank Holidays. Admission is free and there is wheelchair access. The Gallery houses a large collection which was initiated by the Grundy brothers, Cuthbert and John, and it has grown over time to include Victorian watercolours and oils, prints, oriental ivories, ceramics, jewellery, photographs of early Blackpool and modern British paintings. The Edwardian galleries regularly exhibit contemporary sculpture and art. The building of the Grundy art Gallery was commissioned in 1908 by Blackpool Council, after a bequest of thirty-three works of art and a financial gift from the Grundy brothers. A fund for the purchase of new artworks was established in 1912 and to accommodate the expanding collection, an extension of two additional galleries was erected and this was opened in 1938. There are now almost two thousand pieces including works by Gilbert and George, Martin Creed, Augustus John, Lucy Kemp-Welch, Dame Laura Knight and other artists. The Syndicate Super club: 01253 753222 Address: The Syndicate Superclub, 130-140 Church Street, Blackpool,FY1 3PR. Blackpool Zoo - 01253 830 830 Address: Blackpool Zoo, East Park Drive, Blackpool, Lancashire, FY3 8PP. Fleetwood is a fishing town with ' a lovely promenade with picturesque views over Morecambe Bay to the Lake District.' Plus: The Marine Hall, Fleetwood Pier, Marine Lake, The Mount, and Fleetwood Museum. In 2007 there will be international sport on the promenade when St Chad's Headland on the newly redeveloped Promenade stages Beach Volleyball, and there will be top women's teams from across Europe. The televised Blackpool event will be the first time an the finals of a UK beach volleyball tournament has been held under floodlights. Over 200 tons of sand will be moved from the beach to the headland to form the beach court and there will be a 1,000 seat stadium. For more information regarding things to do in the resort see Blackpool Attractions. For information about the history of theatrical productions see Blackpool Shows. The sights, landmarks and attractions that have contributed to Blackpool having the position of being Europe's busiest tourist resort should be mentioned here. The dates given for shows refer to the 2007 season unless otherwise stipulated. While every effort has been made to ensure the accuracy of the details provided here we cannot guarantee that the information is correct, and visitors are advised to confirm details with the venues concerned before booking or finalising their travelling plans. Blackpool Tower. 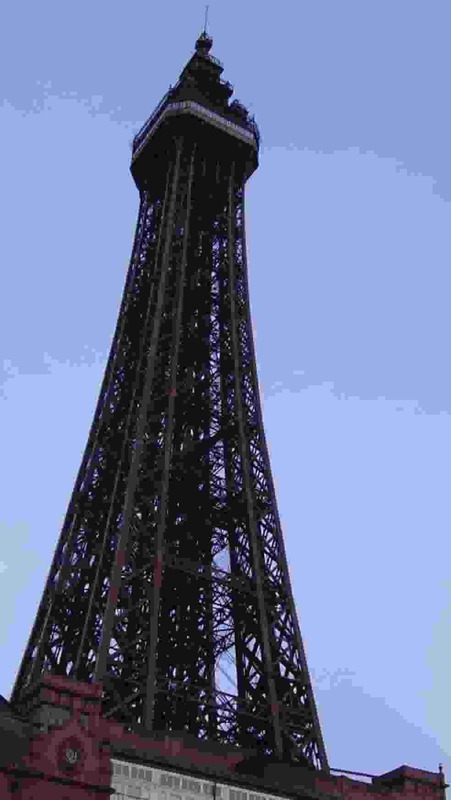 This imposing Victorian structure stands over 500 foot tall and dominates the Blackpool landscape. It was actually designed by Gustav Eiffel who also had the distinction of creating the Parisian Eiffel Tower. However Blackpool Tower is not merely of architectural interest - it is an entertainment centre in its own right - packed with things to do for all the family.